Earlier this month, I highlighted the fact that the latest Samsung Smart TV can and will listen to your conversations, and will share the details with a third party in the post: A Very Slippery Slope – Yes, Your Samsung Smart TV Can Listen to Your Private Conversations. Toymaker Mattel has unveiled a high-tech Barbie that will listen to your child, record its words, send them over the internet for processing, and talk back to your kid. It will email you, as a parent, highlights of your youngster’s conversations with the toy. If Samsung’s spying smart TVs creeped you out, this doll may be setting off alarm bells too – so we drilled into what’s going on. The Hello Barbie doll is developed by San Francisco startup ToyTalk, which says it has more than $31m in funding from Greylock Partners, Charles River Ventures, Khosla Ventures, True Ventures and First Round Capital, and others. Its Wi-Fi-connected Barbie toy has a microphone, a speaker, a small embedded computer with a battery that lasts about an hour, and Wi-Fi hardware. When you press a button on her belt buckle, Barbie wakes up, asks a question, and turns on its microphone while the switch is held down. The doll is loaded up with scripts to read, and one of these is selected depending on what the kid said. If the tyke shows an interest in a particular past-time or thing, the doll’s backend software will know to talk about that – giving the kid the impression that chatty Barbie’s a good, listening friend. When users interact with ToyTalk, we may capture photographs or audio or video recordings (the “Recordings”) of such interactions, depending upon the particular application being used. We may use, transcribe and store such Recordings to provide and maintain the Service, to develop, test or improve speech recognition technology and artificial intelligence algorithms, and for other research and development or internal purposes. We may make such Recordings available to the parent account holder and permit the parent account holder to share such Recordings with third parties. By using Hello Barbie, parents agree to these terms. It’s not clear how long the recordings stay on ToyTalk’s systems. 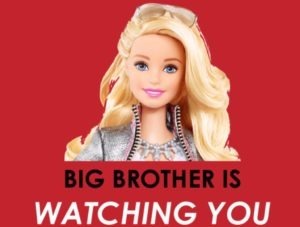 You’ve been warned: Big Barbie is Watching You.